So Jorge Lorenzo’s move from the factory Yamaha team to the factory Ducati team is now old news. Maverick Vinales appears set to abandon the Suzuki team to take Lorenzo’s place. We don’t know which of the current Andreas laboring for Ducati will be dislodged next year, but Sam Lowes has been tagged to move up from Moto2 to unseat either Bautista or Bradl on the Gresini Aprilia. Dani Pedrosa’s seat with Repsol Honda appears to be in play; Suzuki is said to covet him or Dovizioso for 2017-18. With several up-and-comers expected to graduate from Moto2 along with Lowes—Alex Rins and Johann Zarco first and foremost—the silly season is becoming more interesting than the 2016 championship season itself. Especially if Repsol Honda’s luminous Marc Marquez strolls out and dominates Jerez this weekend. Which is entirely possible, after what he’s shown us recently in Argentina and Texas. He appears to be, ahem, back. The looming question as the season rolls into Round Four: who will be Marquez’s teammate starting next year? Dani Pedrosa won a close 2013 affair after going through on polesitter Lorenzo on Lap 6, Marquez running third. The three spent the next 20 laps in that order, coloring in between the lines, but the heat began to take a toll on Lorenzo’s tires, and he appeared to be struggling as the race wore on. Pedrosa and Marquez, on the other hand, looked fresh and, on Lap 27, the rookie began lining up Lorenzo as if he wasn’t a defending double world champion. The two traded positions in Turn 6, Lorenzo refusing to yield. But in the Jorge Lorenzo Corner, of all places, its namesake ran a smidge wide and Marquez, lizard brain calling the shots, dove inside. As Lorenzo attempted to cut back, the two touched, the Mallorcan being forced wide into third place for the day and the season. To say he was unamused in Parc Fermè is a serious understatement. The 2014 race featured an incandescent Marquez winning easily from pole, on his way to starting the season 10 for 10. Rossi managed second place for his second podium of the young season; at that time we had no idea he would end up on the rostrum 13 times on the way to finishing second for the year. Pedrosa went through on Lorenzo late in the day for the last podium spot, another indication that 2014, despite being even-numbered, would not be the Mallorcan’s year. Coming on the heels of his crash in Qatar, a flailing 10th place finish in Austin and a desperate 3rd in Argentina, Lorenzo’s 2014 season was over before it had fully started. 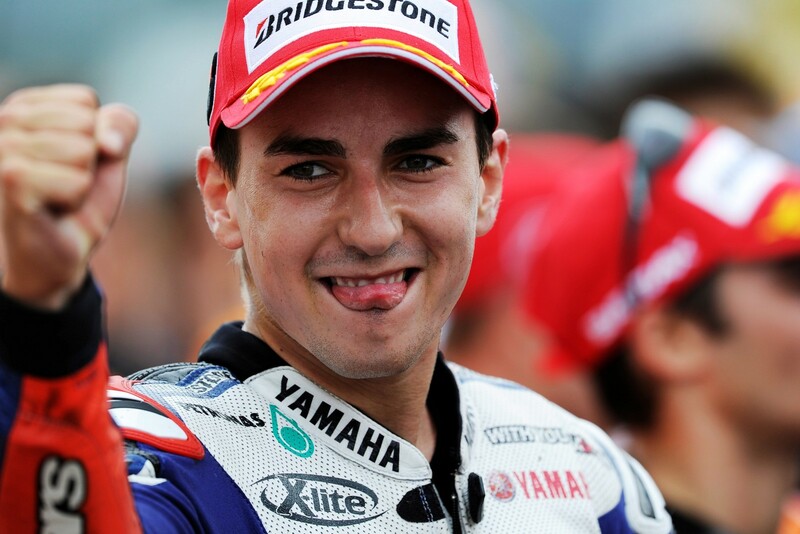 Last year’s race was pure vintage Lorenzo. Qualify on pole, get out in front early, attach bike to rails, press “Go,” and keep the last 26 laps within half a second of one another. Regular as a piston, as dad used to say. The resulting procession left Marquez (nursing a broken pinkie on his right hand) alone in 2nd and Rossi likewise in 3rd. Cal Crutchlow managed a respectable 4th place on the Come What May LCR Honda, with Tech 3 Yamaha’s Pol Espargaro closing out the top five. 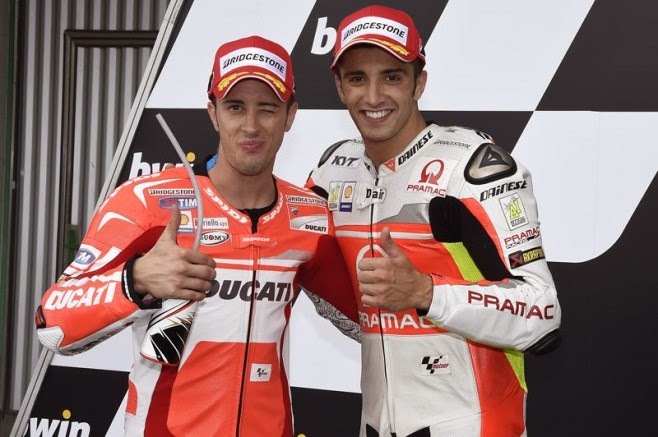 My prediction of having two Ducatis on the podium was met with derision, as Maniacal Joe Iannone topped the Italian effort in 6th place, teammate Dovizioso having gone walkabout on Lap 2 on his way to a disappointing 9th. Valentino Rossi re-ups with Yamaha weeks ago and is assured of a sweet ride through the end of 2018. Coincidentally (?) he’s off to his worst start since 2001, ignoring the lucrative Ducati dumpster fire of 2011-2012. Bradley Smith, late of the satellite Yamaha team and moving on to richer pastures with the nascent factory KTM project next season, has amassed 16 points thus far this year. In 2014 he had 20; last year he was at 26. Something has interrupted his trajectory, and I think it’s the money, a semi-conscious effort to avoid crashing before the big payday arrives. On Monday it was announced that Lorenzo had signed his deal with Ducati, in exchange for wheelbarrows full of euros, 12-15 million at last estimate. The end of the 2015 season left the proud Spaniard’s ego bruised, with Yamaha unable to celebrate his championship in a “suitable” fashion while Rossi fumed and spat about a Lorenzo/Marquez conspiracy to deprive him of the title. Jorge chalked up seven wins in the last 15 rounds last season. It says here he will fall short of that mark this year. On some level, conscious or otherwise, he may wish to punish Yamaha for their reverence of his rainmaking teammate and rival. Saving himself for his new love and avoiding risk this season would manifest such desire; a rejuvenated Marquez would increase the possibility. Maverick Vinales may prove the exception to the rule, as he is still trying to earn his Alien card and likely feels a good deal of loyalty toward the Suzuki team that sent his star rising. If and when he signs his deal with Yamaha, I would expect him to keep pushing for podiums and wins, which may be within his reach at some circuits on the calendar. He’s young enough not to fully appreciate the risks inherent in his sport, and has, as far as I know, not a single gram of titanium in his body. Compare this to Dani Pedrosa, 20% of whose body weight is metal. When Dani goes through airport security, klaxon horns blare and the lights start strobing. Fans of Nicky Hayden will note that he recorded his first WSBK podium this past weekend at Assen, pushing him up to fifth place for the season. Having watched him jump on a cruiser and immediately break the rev limiter at the AMA Indy Mile a few years ago, I thought Superbike would be a walk in the park for a guy who’s been riding since he was three. Not so. But he seems to be figuring it out, and few North American racing fans can be sorry to see him doing better. You’ll not find a nicer, more accessible guy in the paddock than Nicky Hayden. As of this writing, the weekend forecast for Jerez de la Frontera is pretty much ideal—dry with temps in the mid-70’s. They’ve been racing bikes at Jerez longer than at any other circuit outside Assen, though her glory has faded somewhat in recent years as the Spanish economy bottomed out. Having attended the race in 2010, when Lorenzo came from WAY back to overtake Pedrosa on the last lap, I would be reluctant to count Jorge out this weekend. 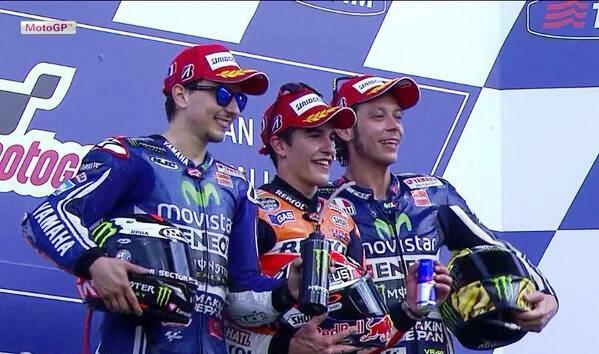 My personal forecast is for an all-Spanish podium, one which includes Maverick Vinales. The race goes off early Sunday morning EDT. We’ll have results and analysis later in the day.